I just made some photos of my new Tunesian Village for Flames of War and want to share them with you. I bought the models 2007 on the Salute Convention from Kerr & King. Assembling the models was very easy. You only need some glue and a bit putty for some gaps. The modelkits allow you to assemble the houses in multiple different ways and you only need yome minutes to build a whole village. I painted the houses with Vallejo Game Color. For priming I used Earth. A basecoat was drybrushed with a 50:50 mix of Earth and Bonewhite. Highlights were added with more bonewhite in the mix and later a mix of Deadwhite and Bonewhite. The last hightlight was a very light drybrush of Deadwhite. The doors were painted with a mix of Charred Brown and Cobra Leather. 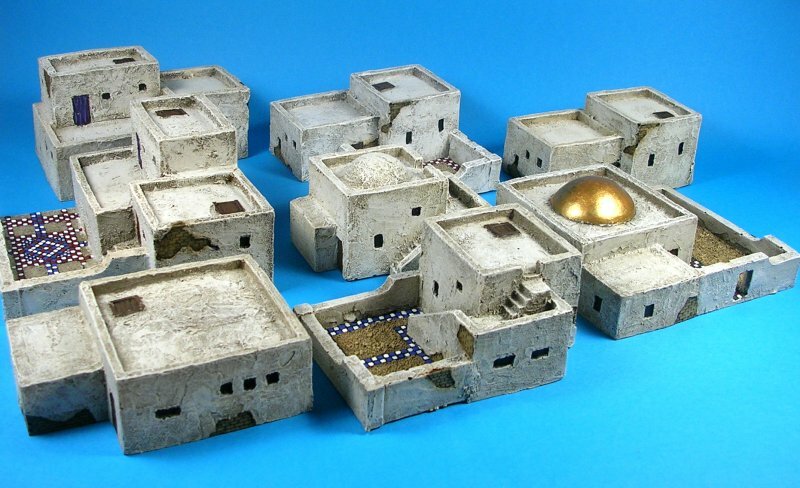 With a bit work you get a very nice Terrain Piece for your Flames of War desert gameboard. I hope you like my new Tunesian Village.